This mason jar full of orange-hued juice is starting to look familiar, huh? The good news is I'm keeping up with my (almost)daily juicing. The bad news is my What I Ate Wednesday posts are getting a bit repetitive. 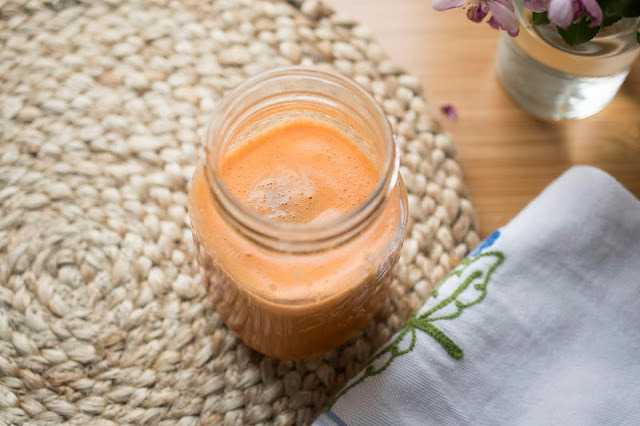 This week's day of vegan eats starts with the usual juice - a blend of carrots, apple, orange and celery. The fresh-squeezed juice is a great start to the day, especially since I don't usually feel much like eating first thing in the morning. I usually have to follow it up with something more for breakfast though. 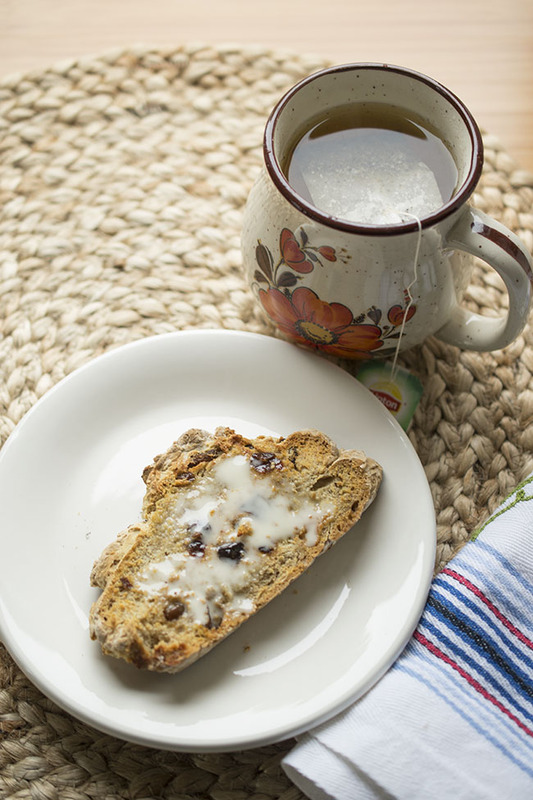 On this particular day, I toasted a slice of homemade cinnamon raisin soda bread and topped it with vegan margarine. This bread is so quick and easy to make - I'm going to share the recipe this week. I also had a cup of decaf green tea. We had friends over for a visit on the weekend and they brought some lovely slow cooker curried chickpeas. 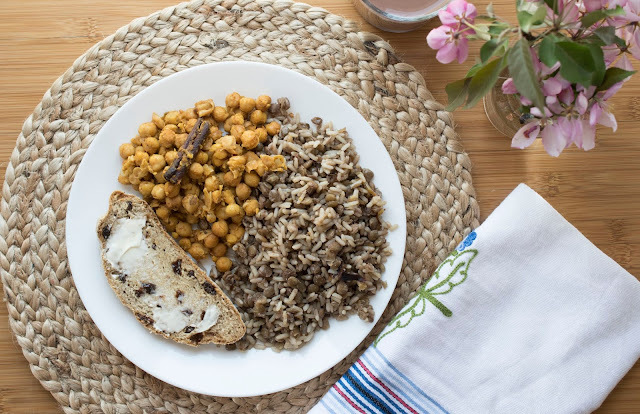 My lunch on the day I'm featuring was leftover chickpeas with lentils and rice and another slice of soda bread. 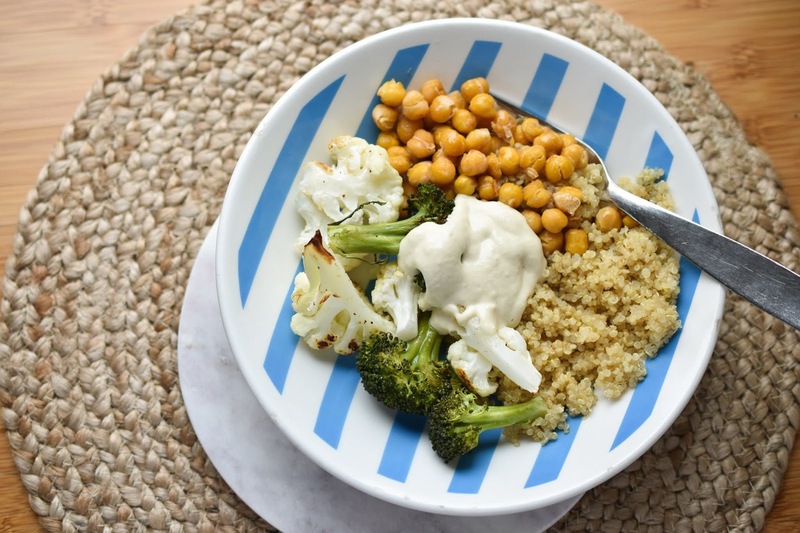 Dinner was an Oh She Glows Buddha Bowl made up of quinoa, roasted broccoli, cauliflower and chickpeas and a tahini garlic sauce. So easy to prepare and so tasty. I neglected to photograph my evening snack. I'm pretty sure that's because it involved chocolate and who can stop to photograph chocolate? More specifically, it was homemade vegan chocolate brownies topped with coconut whipped cream and vegan chocolate ice cream. Yum. Have you done any juicing lately? Do you feel hungry in the morning? What is your go-to breakfast? Still good looking meals for the week, even if they are simple :) Way to go on keeping up on the juicing! Wow those chickpeas sound amazing!! I might have to try those because I love crockpot recipes in the summer!